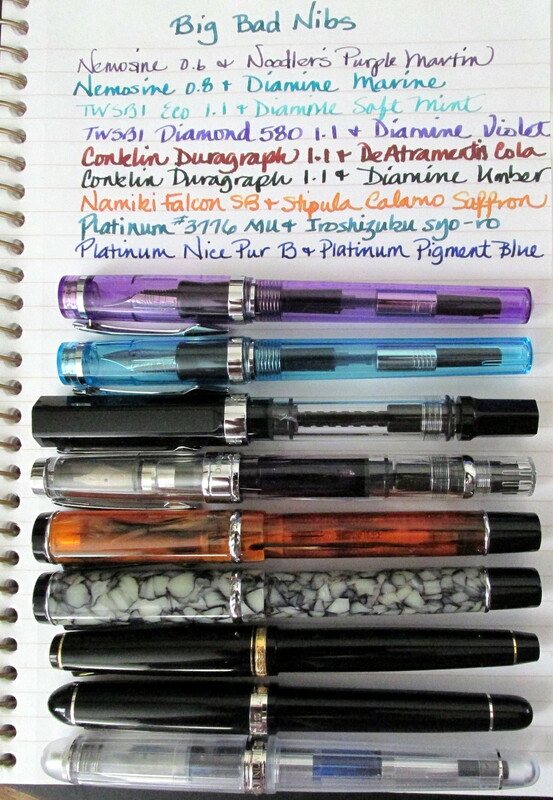 Here are some of the pens on my desk that have wide, stock nibs. None of them have received any tinkering. Purchase one, and you should see comparable performance. The paper is Staples Bagasse that showed a little feathering with the wettest nibs. 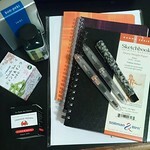 The worst offender was DeA Cola which has exhibited that fault on a few other brands of paper and the Duragraph which is certainly a free-flowing nib. Perhaps not the best combination, but I am still enamoured with it. The most well behaved was the Platinum Century Nice Pur B with Platinum Pigment Blue. No matter how long it goes unused, the nib flows without hesitation. Considering how many pens I have inked, that is a very, very good thing. I really need to acquire some DeA Cola. Also, Syo-Ro is looking great with your music nib. I have had very good luck with bagasse paper, and find that it holds up well with most pens and inks. Your writing sample is definitely representative of my own experience. Do you know if Staples is still selling bagasse in tablets or if it’s only available in spiral notebooks at this point? Cola is a good color, but it can feather depending on the flow. I like the color well enough to use it regardless. I have only seen bagasse in spiral notebooks, but I haven’t looked for tablets in at least a year. Hope you find some. The texture is really lovely with fountain pen nibs and inks though it can exhibit excessive show-through and even bleed-through on occasion. My wide nibs tend to bring out those qualities in paper, so I just write on one side. 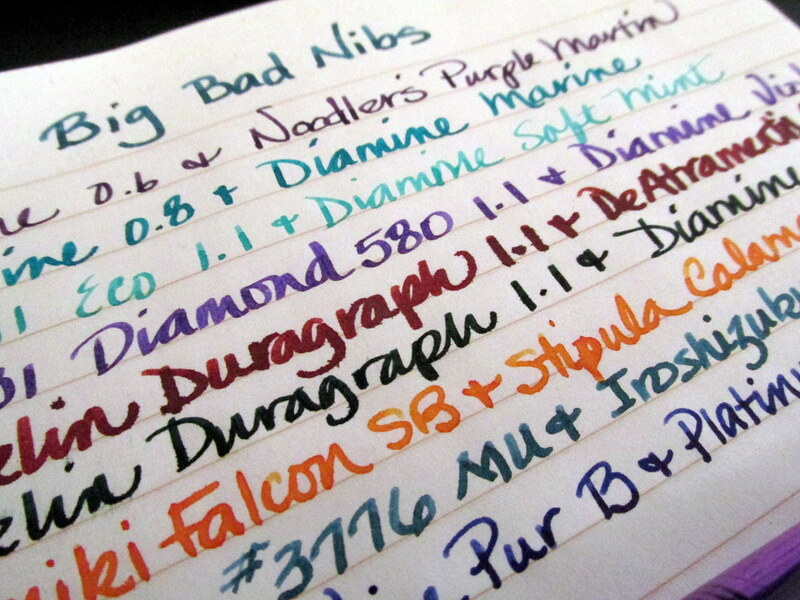 How do your fine nibs fare on it? I was able to stock up on some tablets a while back, but unfortunately my stash is dwindling to the point where I’m hoping maybe Staples changed their minds and began producing the tablets again. I have had very good results using all types of nibs on bagasse tablets, but I think the success is very pen/ink combination dependent. I have seen some minor feathering when pairing wet writing fine and medium nibs with inks that happen to be more lubricated. From your lips to Staples ears.